I'm not saying that the climate in Calgary is unfit for human habitation (I've been to Winnipeg), I just think that 7 degrees and raining is not my idea of good living in September. Perhaps I have lost my Calgary grittiness after alternating my time between tropical and temperate climates for the last year. The fact is that I've signed up for a stage race in Guatemala in early October and I need to put in some serious time on the bike. And, Calgary is not offering up the conditions that I deem suitable for training. So, a Westjet seat sale was all that it took to get me down to Palo Alto for a few days. Accommodation was generously provided by Liz (in fact, her parents, since she is also staying with her parents), who lives just a few miles from the Stanford University campus and similarly close to some grade A cycling roads. Having been schooled in Canada, my impressions of American college life have been shaped by movies like Revenge of the Nerds and Animal House. I was curious to check it out first hand. 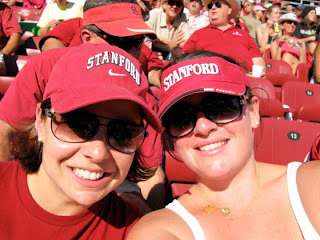 While we were unable to check out any wild frat parties, we did have a nice cruise around campus by bicycle and an afternoon at a Stanford football game. If the football crowd is any indication, the depiction in the movies is pretty accurate. In my next life, I'm going to college in the US. And probably to Stanford, because the cycling around there is awesome.